or wrap it up in 'wisdom' and 'parchment wrinkles'. But no one mentions peace and joy. displayed the bootings and sprayings of vandals. relaxed and fallen, drooping, pollen-heavy. be happy in a home of your own making. honey-eater. The sweetness. The plenitude. Cathy Bryant won the 2012 Bulwer-Lytton Fiction Prize for the worst opening line of a novel, and is a former blogger for the Huffington Post. Her stories and poems have been published on five continents, so her ambition is to break into the Antarctican market. Also in 2012, Cathy won the Sampad 'Inspired by Tagore' Contest, the Malahat Review Monostich Contest and the Swanezine Poetry Competition. In 2013 Cathy won the M.R. Jordan Winter Writing Contest. She co-edits the annual anthology Best of Manchester Poets and her collection, Contains Strong Language and Scenes of a Sexual Nature, was published recently. 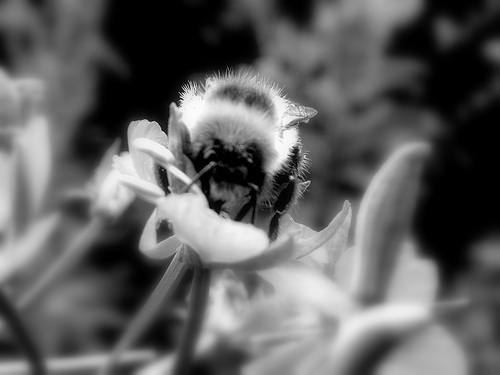 Photography: Bee in Black, by Adam Moralee.